If you are considering a watermaker then please look through our comprehensive range of makes and models, and call us to discuss any questions on 02381 888250. Our many years experience and large range of products will ensure you get the right watermaker for your needs. All makes servicing and spares facilites - we travel worldwide. Once water reaches your tank nasty chemicals, bacteria and virus can quickly contaminate it causing illness - give you and your crew the peace of mind of having pure, sterilised water on tap - simply plumbs into your galley water supply. Removes smells/bad tastes and kills bacteria/virus/cysts. Easy change carbon filter and stainless steel UV sterilisation unit. NEW for 2019 - Nautilus Marine Simple 60 AC watermaker - a rugged UK made no frills watermaker at a very competetive prive - for more info click link top of left column. What we consider the best battery powered DC watermaker in its class just got better - superb build quality, reliabiity and ease of use - low energy consumption (from 9amp @ 12V DC) 12/24V DC watermakers to last. See the Osmosea range in our watermaker section. 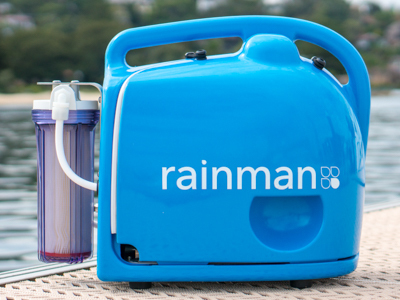 We are pleased to have been appointed as distributors for Australian made portable watermakers Rainman. more details to follow shortly. Ex display watermakers to clear - with full warranty - check our used and ex demo section. NEW and exclusive to Sailfish Marine - Eco-Sistems SP25DC energy recovery watermaker - without doubt the best value unit available. Low power consumption energy recovery ststem 12 or 24V DC operation, 25 - 30 litres per hour production, fully automatic pressure regulation, compact and easy to install/maintain, latest ceramic valve technology. Worldwide service & support. £3795.00 plus VAT and delivery - now in stock. click here for more details. Special offers - range of extra special offers on watermakers and generators. NEW! Feb 2014 - SeaSpray 'P' series ultrathin semi flexible solar panels - more power - smaller size - less money! click to view. NEW!! Eco-Sistems Integral 12/24V DC 30l/hour watermaker. NO high pressure hoses! VERY Quiet! We are a small company who keep our overheads down and pass the savings to you! WE SHIP WORLDWIDE - Tax free if you qualify - just ask for details.